(Nov. 16, 2011) -- UTSA is in the running for highest attendance in the first season of football, so be there at 1 p.m., Saturday, Nov. 19 for the game vs. Minot State. Fill up the Alamodome and help UTSA set the season attendance record as we finish the historic inaugural season of UTSA football. With the theme, "Finish Strong -- Orange Out," attendees are encouraged to wear their UTSA orange. 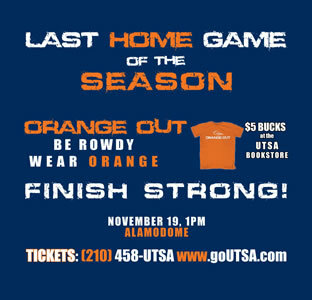 UTSA Orange t-shirts are available for $5 while the supply lasts at the UTSA Bookstore in the University Center. Faculty and staff members can buy three tickets and get the fourth free, plus an official Orange Out t-shirt. For tickets, go to Roadrunner Express in the University Center on the Main Campus, call 210-458-UTSA or visit www.goUTSA.com. For more information, visit the UTSA Football Game Day website or the UTSA Athletics website. Tailgating starts at 8:30 a.m.
Rowdy Town, 10 a.m.-1 p.m.
Buy park-and-ride tokens in advance at Roadrunner Express (UC on Main Campus) or Durango Building activities center (Downtown Campus) -- $2.50 round trip for students, $5 round trip for public. Without token, exact change is required when boarding. At Main Campus, park south of Convocation Center in any unmarked space (UTSA permit not required game day). VIA buses leave UTSA Rec Center starting at 10 a.m. with last trip departing at 12:15 p.m. The last bus will depart the Alamodome 45 minutes after the game. Park at Downtown Campus in any unmarked space (lots D3 and D4, UTSA permit not required on game day). Then, ride to Alamodome using VIA from Downtown Campus (board at Durango Loop lot across from Durango Building) -- $1.10 round trip (students), $2.20 round trip (general public). On return trip, board express route bus to UTSA Downtown Campus.